What type of stroller can I gate check? Should I bring the car seat on the airplane? What IDs do my kids need? Perk: Amazon has a special stackable offer just for Red Tricycle readers! Save an additional $5 at checkout using code REDTRI. Click here for details. From snacks to changes of clothes, you’re never one to start a trip unprepared. 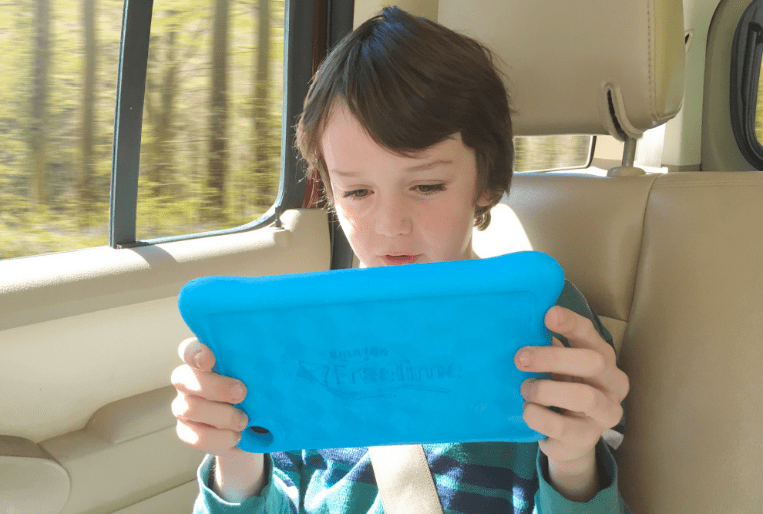 But, when it comes to entertainment you simply need to pack one thing only: Amazon’s Fire 7 Kids Edition tablet. Each tablet includes a one-year subscription to Amazon’s FreeTime Unlimited, an all-in-one app that provides unlimited access to over 15,000 kid-friendly books, videos, apps and games. And it’s good stuff, too. We’re talking content from PBS Kids, Disney, Simon & Schuster, Amazon Originals and more. Kids can also enjoy access to over 55,000 websites and YouTube videos in the FreeTime kid-safe web browser. Amazon’s FreeTime Unlimited also has a new feature: download your child’s favorite videos, educational apps, games and books for access when you don’t have wifi. Simply tap and hold on a video, app, or book and download to your child’s FreeTime profile. When an Internet connection is unavailable, your child will automatically see available content that has been downloaded to their FreeTime profile. With so much entertainment at their fingertips, your kids may never want to leave that airplane seat.